In 2019 the Steiner-Waldorf movement will be 100 year old! 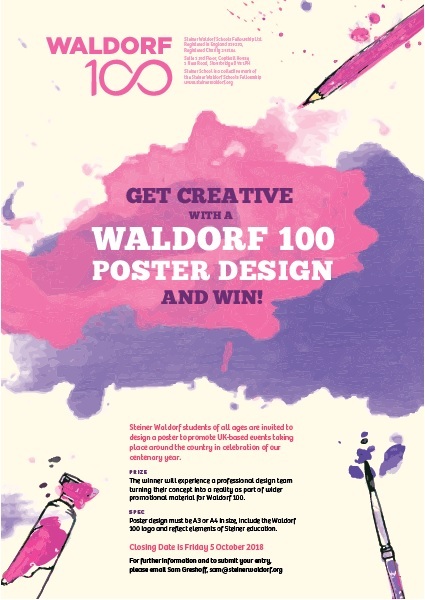 Students at UK Steiner schools have been taking part and creating a poster design incorporating the pre-existing Waldorf 100 logo, to promote UK based Steiner-Waldorf events that will take place around the country. We have some very exciting news to share with you all; we are so proud to announce that one of our fantastic students has won the Waldorf 100 poster competition. This means that their poster will be seen world wide and used to advertise the Waldorf 100! The winner’s design will be used in the Waldorf 100 UK celebratory packs, which will also include materials to help support events that schools will be running.